Tiger Woods, an American professional golfer and the world's first athlete to earn over a billion dollars. Marriage: Married Elin Nordegren in October 2004. Extramarital affair was revealed in November 2009. Divorced in August 2010. Children: Daughter Sam Alexis Woods was born in 2007. Son Charlie Axel Woods was born in 2009. The career earnings of Tiger Woods from golf tours is more than $100 millions. But his major income is from endorsements. He earned around $110 million from winnings and endorsements in 2008. Forbes estimated Tiger Woods is the first athlete to earn a billion dollars and his net worth should be about $600 million in 2009. After a car accident in November 2009, his extramarital affair was disclosed. Tiger Woods tried to save his marriage and announced an indefinite hiatus from professional golf in December. His transgressions even impact the market values of sponsor companies. Economics experts estimate his affair causes stock shareholder loss between $5 billion and $12 billion. Tiger Wood has also lost some of endorsements from major sponsors. The following is the Tiger Woods's Chinese Astrology Birth Chart. We want to analyze his Chinese Astrology using the theory of Five Elements, Metal, Water, Wood, Fire and Earth to reveal his wealth, relationships, marriage and career. Tiger Woods was born on the Metal Dog day in the Earth Rat month of the Wood Rabbit Year. The upper row of the Day Column is called Day Master, which represents the person. Therefore, Male Metal represents Tiger Woods himself. All the animals can be converted into Five Elements. We then assigned the scores to them; it's easier to understand Five Elements in the birth chart this way. From the Circulating Relationship of Five Elements, Earth is the mother element of Metal. Earth can protect Metal. Water is the mother element of Wood. Water can help Wood (tree) to grow. From the chart of Five Element in Animals, Rabbit in the birth chart is the Female Wood. Rat is Female Water and Pig contains Water and Wood. From the above Five Element Scores chart, we can see the score of Water and Wood together is much higher than the score of Earth and Metal. Metal and Wood are opposite elements. Water and Earth are also opposite elements. Wood and Earth are enemies to Metal. Obviously, the Day Master Male Metal is weaker than enemies. It needs help from mother Earth. We can say that Earth and Metal are the Lucky Elements to Tiger Woods. Water and Wood are the unlucky elements. Tiger Woods was born in December, winter time. Winter is the season of Water. The Water is cold and strong. There are not too much Fire in the birth chart. A little bit more of Fire can warm up and balance the birth chart. Therefore, Fire is the next Lucky Element to Tiger Wood. To find more about people's career, fame, wealth, health, parents, spouse and children from Chinese astrology, we need to use 10-God birth chart. The right-most column is the Year Column, which contains information about early ages. The 2nd right-most column is Month Column, which contains information of growing-up ages and family. The 4th right-most column is the Hour Column, which contains information of old ages and children. Chinese astrology breaks down the Five Elements by Yin Yang into 10 elements, which is called 10 Gods. Cow, Sheep, Dog and Dragon are Earth. Chicken and Monkey are Metal. Rabbit and Tiger are Wood. Rat and Pig are Water. Horse and Snake are Fire. Dog contains Yin Fire, Yang Earth, Yin Metal. Tiger contains Yang Earth, Yang Wood, Yang Fire. The Five Stars can be distinguished by Yin and Yang, and are derived into 10-God relationships. We have the Tiger Woods' 10-God Relationship Chart on the right. There are two Property Stars in the Year Column (Wooden Rabbit). That's implies Tiger Wood will deal with lots of money in his early age. The Actor Star shows in the Rat of Month Column. The Actor Star is Water and the Property Star is Wood. Water is the supporting element of Wood. That indicates that Tiger Wood's performance creates more money opportunity. There is an Artist Star and a Windfall Star in the Pig of Hour Column. They are all the gene of wealth in Tiger Woods' birth chart. That means there are many treasures around Tiger Wood. But he needs intelligence, courage and determination to bring them home. Day Master Male Metal represents Tiger Wood. One Guardian Star of Month Column is next to it. The other Guardian Star of Day Column is under Day Master. That says Tiger Woods has very good protection from his parents or family friends and support from his spouse. The Guardian Star is the Earth. This Earth protection shield can relieve the pressure from the Fire, which is the career. Thus, career becomes easy to Tiger Wood, Fire becomes one of the Lucky Elements. The Angel Stars are found in the Hour Column and Day Column, the career luck of Tiger Wood will be good in his late age. The following is Tiger Woods' Major Cycle List which foresees his major luck in his entire life. To foresee major luck in your life, please visit The Rise and Fall Chart of Your Life on our website. Because Money Wood is stronger than Day Master Metal. Wood represents Money, but it brings pressure to Tiger Wood. If Metal becomes strong, then Money Wood is easier to conquer. Therefore, Metal will increase his wealth. Water is the Child Element of Metal, so Water will weaken Day Master. Water is related to performance, reputation, poor health or wrong investment. Water is afraid of Earth. Earth is the Mother Element of Metal. so Earth brings him fame, good reputation and good health. To predict the result of the fortune, we need to apply the Stem (Five Element) Relationships, Branch (Animal) Relationships and Branch Special Relationship theories between the Birth Chart and Astrological Cycles. Fire gives Day Master Metal pressure. Fire represents discipline. Pig is Water. Water makes Tiger Woods smarter. He won Junior World Golf Championships six times from 1984-1991 and competed first PGA Tour in 1992. Fire is career. Dog is Earth. Dog and Rabbit in the Year Column have attraction relationship into Fire. This is good career cycle to Tiger Woods. He enrolled at Stanford University in 1994. He won U.S. Amateur titles and NCAA Golf Championship before he became a professional golfer and endorsed by Nike and Titlelist in 1996. He achieved the number one World Golf Ranking in 1997. He became the youngest golfer to achieve the Career Grand Slam in 2000. Buick began to endorse Tiger Woods in 2002. Wood is money opportunity. Female Wood and Day Master Metal have attraction relationship into Metal. Metal is the money income. This means money come to see Tiger Woods. Chicken is in the Metal group. Chicken and Dog in the Day Column have attraction relationship into Metal. This indicates that money comes to Tiger Woods on the table and under the table. He lost his titles during 2003 and 2004. But he won the heart of Swedish supermodel Elin Nordergren. They got married in 2004. He regained the major Golf Championship titles in 2005. He got knee injury in 2008, but he still earn more than 5.7 million dollars from the competitions. He returned strongly and earned more than 10 million dollars from PGA tours in 2009. Tiger Woods admitted transgressions in marriage and announced an indefinite hiatus from professional golf in December 2009. Wood can attack the Earth in the Month Column. Earth cannot fully protect Day Master Metal. That implies reputation or health might be impacted related to money or women. Monkey and Rat in the Month Column have attraction relationship into Water. He might involve more in charity or foundation for kids. But negative reputation or poor health might arrive. Monkey is in the Metal group. With the support of Dog and Monkey, Tiger Wood still have good money earnings and money won't cause big problem to him. Female Water and Male Earth in the Month Column have attraction relationship into Fire. Day Master Metal loses one protection and Fire is unfavorable to Metal. Sheep is in Earth group. Earth is the protection element to Metal. But Sheep, Rabbit in the Year Column and Pig in the Hour Column have attraction relationship into Wood. This strong Wood can attack the Earth Dog in the Day Column. If Dog is damaged, then Day Master Metal will be in danger. This cycle is unfavorable to Tiger Wood. There might be an issue with his health, female relationships, or even money loss. There is a Fire element hidden in the Dog. That Fire is the key to protect Earth Dog. If Dog survives, then Day Master Metal is safe. Male Water and Female Fire in the Hour Column have attraction relationship into Wood. He will have spend more time with his children. The children or his foundation regarding to kids will inherit a big fortune from Tiger Woods. Horse and Dog in the Day Column have attraction relationship into Fire. Tiger Woods will focus on more his marriage or family business. The Day Master Male Metal represents Tiger Woods. The Dog under Day Master is the Palace of Spouse. The Property Star Female Wood represents wealth or his spouse. The Windfall Star Male Wood represents money or girl friends. Two Property Stars is in the Year Columns and one Windfall Star hides in Hour Column. There is no Property Star or Windfall Star inside the Palace of Spouse. That implies the wife of Tiger Woods shouldn't stay home all the time. She should be a career woman. Earth is the mother element of Day Master. Male Earth is next to Day Master in the Month Column and under Day Column. That means the parents of Tiger Wood is very close to him, even in his marriage life. Mother Element Earth and Spouse Element Wood are opposite element. It's hard to be Tiger Woods' wife. A better marriage life for his wife is to have her own career. To stay at home is not a smart choice. The Day Master and Female Wood of Year Column have attraction relationship into Metal. Rabbit of Year Column is Female Wood. Female Wood represents women to Tiger Woods. Plus, Rabbit is the Romance Star to people whose born on a Dog Day. Rat in the Month Column is the Love Star to people born in year of Rabbit. All these signs implies Tiger Woods tends to have good relationships with females publicly and secretly. He has lots of chances and knows how to build up the good relationships. Since Female Wood in the Year Column is outside the Palace of Spouse, Tiger Woods looks for only the female relationships. Those relationships don't have any commitment at all. The Palace of Spouse is the information about Tiger Woods' wife. Dog in the Palace of Spouse and Rabbit in the Year Column have attraction relationship into Fire. Dog of Palace of Spouse contains mainly Male Earth. Rat of Month Column contains Female Water. Male Earth and Female Water have attraction relationship into Fire. Dog of Palace of Spouse also contains Female Fire. Pig of Hour Column contains Male Water. Female Fire and Male Water have another hidden attraction relationship into Wood. All these attraction signs mean the people relationship of Tiger Woods' wife is pretty good, too. Tiger Woods has many attraction relationships. His wife has her own attraction relationships. This is a very bad sign for the marriage. If anyone is not mature under this situation, then a second marriage is possible. The Day Master Male Metal is weak. Metal is afraid of Fire. A Female Fire of Hour Column is next to Day Master, which needs the support from Mother Element Earth. The Dog of Palace of Spouse is in the Earth group. Tiger Woods needs the support from his wife. But Dog and Rabbit of Year Column have Fire Relationship. Dog and Rat of Month Column have hidden Fire relationship. That means his spouse enables to bring into Fire against Day Master Metal. Tiger Woods should be very respecting his spouse. He will try to listen his wife and maintain the marriage all the way. Tiger Woods got engaged in November of 2003, which was the Female Water Sheep Year. Female Water Female Water and Male Earth of Month Column have attraction relationship into Fire. So both sides of parents should have been very happy about this engagement . Sheep, Rabbit of Year Column and Pig of Hour Column have very strong attraction relationship together into Wood. Wood is related to female. It's very surprising that they didn't get married in 2003. Tiger Woods got married in 2004, which was the Male Wooden Monkey year. Wood represents female to Tiger Woods. 2004 is in the 10-Year Major Cycle Female Wooden Chicken, which is from 2003 to 2012. and Day Master Male Metal have attraction relationship into Metal. A female Wood comes into Day Master life. So this relationship makes Tiger Woods happy. Chicken, Monkey of 2004 and Dog of Palace of Spouse forms a very strong relationship into Metal. Metal is the Lucky Element to Tiger Woods. Therefore 2004 became a better marriage year than 2003. It's possible that Tiger Woods was so focused on the love event, that he didn't win any major golf titles during the years 2003 to 2004. In Chinese astrology, wife and money are the same element to a man. Although Tiger Woods lost lots of tournament winnings, he still won a beautiful wife. This is all because that his Female Wooden Chicken 10-Year Major Cycle is a strong Money and Love cycles. Tiger Woods' current Major Cycle is Female Wooden Chicken. Female Wood is connected to woman or spouse. There is another Female Wood in his Year Column. Rabbit of Year Column contains the third Female Wood. Another Male Wood hides inside the Hour Column. There are too many women surrounding his life. Since Female Wood and Day Master have attraction relationship into Metal, those relationships makes Tiger Woods feel he has become a stronger person. In November 2009, Tiger Woods' extramarital affair was disclosed. The Day Master Metal is afraid of Fire. So Fire gives Metal discipline and brings Metal pressure. Fire should be able to prevent transgression behavior. Fire is found in the Hour Column and another Fire is hidden in the Dog of the Palace of Spouse. But the Chicken of the Major Cycle and Dog have an attraction relationship into Metal. The Fire in the Hour Column is under Pig, which is Water. Tiger Woods was born in the winter time. Thus, Fire becomes pretty weak and unable to give any restraints to Day Master Metal. 2005 is Female Wood Chicken. This is the second year after marriage. With Chicken and Dog attraction relationships, he had very happy marriage and love life. 2006 is Male Fire Dog. Fire ties up Day Master. Tiger Woods was a family man. 2007 is Female Fire Pig. Fire is under Pig. Pig is Water and Fire became weak. Tiger Woods had more freedom then 2006. 2008 is Male Earth Rat. Earth can weaken Fire. Rat is Water. Fire became weaker, which brought in the extramarital affair. 2009 is Female Earth Cow. Cow is Earth. The Child Element Earth continues to weaken Fire. The marital-infidelity scandal was revealed after the car accident. 2010 is Male Metal Tiger. Tiger contains Wood and Fire. Tiger and Rabbit of Year Column together form a strong Wood. Tiger and Pig of Hour Column have attraction relationship into Wood. Wood is related to money and women. So Tiger Woods will deal with money and women issues in 2010. Both Tiger and Dog of Palace of Spouse contain Fire. Fire is related to career. He will come back to golf in 2010. Tiger Woods will still have decent incomes from tournament winnings and endorsements from commercial companies in the years to come, because the current Major Cycle Female Wooden Metal is a very strong money cycle, which won't end until 2013. Tiger Woods spoke publicly for the first time on his scandal. He is deeply sorry about his selfish and foolish to his family and the public. There is no schedule for his return to golf. February 2010 is Earth Tiger Month. Earth is the Mother Element. He got the support. Tiger contains Wood and Fire. Therefore he is under pressure (Fire) to face money or women (Wood). Now Tiger Woods puts marriage on the top of career. The marriage relationship must be stable before returning to golf. He has better chance to amend marriage relationship during the fall of 2010. But the career luck is waiting for him in the summer. Tiger Woods returned to 2010 Masters Golf Tournament in April 8 and finished for 4th. The marriage issue is still unsolved. It sounds that Tiger Woods is the same old Tiger Woods. Tiger Wood officially announces his divorce on August 23, 2010. He didn't make it since he puts his career over the marriage. Tiger Woods didn't save his marriage in 2010. He has lots of trouble focusing on golf PGA tour in 2011. What's wrong with him? Tiger Woods' current Major Cycle is Female Wooden Chicken. Female Wood and Day Master Male Metal have attraction relationship. , Chicken and Dog of Day Column also have attraction relationship. His marriage should be good during 2003-2012. The problem is that the year of 2011 is Female Metal Rabbit. Female Metal of 2011 and Female Wood of Major Cycle have fighting relationship. Rabbit of 2011 and Chicken of Major Cycle also have fighting relationship. The both of fighting relationships destroy the attraction relationships between Major Cycle and Day Master. The Day column of the birth chart is connected to marriage. That means the fighting relationship take away the harmony of his love relationship. The fighting between the Major Cycle and 2011 is outside the birth chart. This implies the outside world is too noisy for Tiger Woods. The emotional reason disturbs his concentration on the golf field. 2010 was Male Metal Tiger. The Male Metal of 2010 and Female Wood of Major Cycle have attraction relationship. So his marriage was fine during the first half of 2010. However, Tiger is in Wood's group. Rabbit of Year Column and Tiger of 2010 together became stronger Wood. Wood created fighting relationship with the Chicken of Major Cycle. So we can say 2010 was the precursor of poor love life of 2011. If he can hold the marriage in 2010, then he still has a harder time in marriage during 2011. 2012 is Male Water Dragon year. Male Water and Female Fire of Hour Column have attraction relationship. Dragon is the last year of Wood cycle. Dragon still helps Rabbit of Year Column increasing the power of Wood. But, Dragon and Chicken of Major Cycle have attraction into Metal. So the outside world won't bring that much pressure to him. 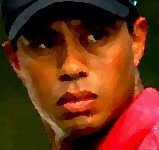 2012 won't be a bad year to Tiger Woods. However, Dragon and Dog of Day Column have fighting relationship. It looks that Dragon brings the mixing attraction and fighting relationship into his marriage life. This is normal to him. His birth chart has many attraction relationship with astrological cycles. So he is popular, has many fans and complicate relationship in love.